This timeline depicts retailer Tesco's number of stores worldwide from 2008 to 2018. 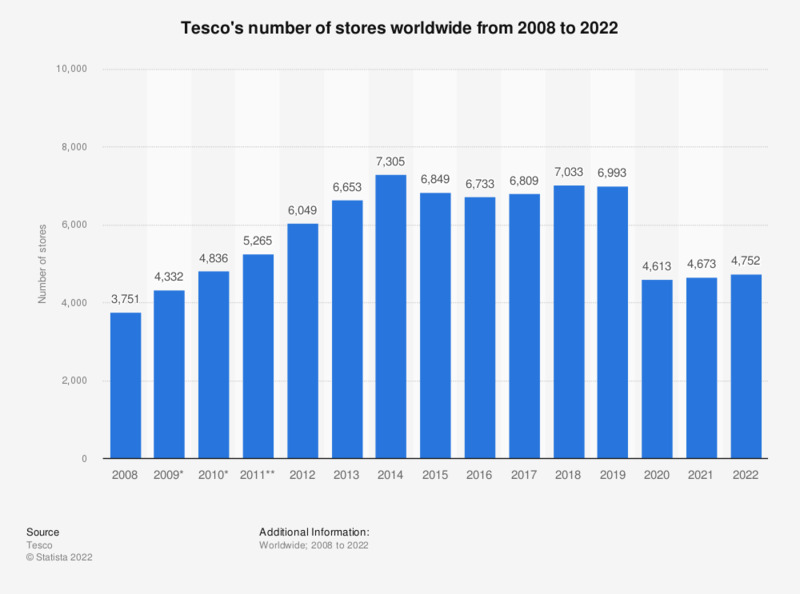 In 2008, Tesco operated 3,751 stores worldwide, which has increased to 6,966 stores by 2018. The multinational-operating grocery and general merchandise retailer Tesco PLC was founded in 1919 by Jack Cohen (1898-1979). The product portfolio includes food and beverages, clothing, home appliances, and financial services. Tesco is one of the leading supermarket brands in the United Kingdom (UK), consistently ranking highest in terms of grocery market share. The company is headquartered in Hertfordshire, United Kingdom and employs over 500,000 people worldwide. Number of stores at year end. Tesco's fiscal year 2013/2014 ended on February 22, 2014. * Restated to include Dobbies stores.